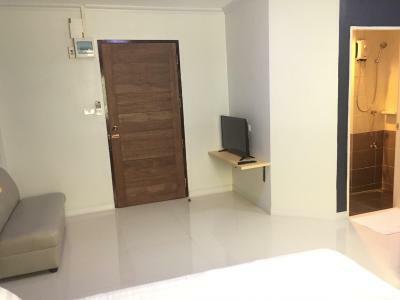 Lock in a great price for A-Place Suvarnabhumi – rated 8.4 by recent guests! Check in 7:30am very quick and very friendly and helpful staff. Everything clean and working fine. Checked out next morning 5am very quick and taxi in time to return to the airport. Only 10 minutes to the airport. The room was clean and comfy. Close to BKK airport. They arranged for my taxi ride to BBK. Lots of English speaking channels on the TV. Good room all in all. Clean, comfortable, the food was very good at the place just outside the building, but there are only freight yards around for walking. 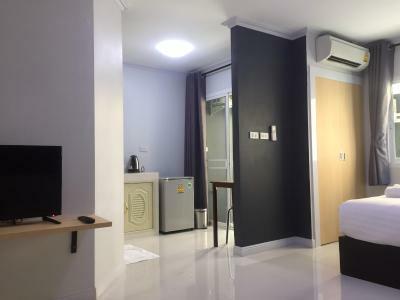 It is really a good place to stay for coming and going from the airport. This was the perfect place to spend the night before an early flight! So close to the airport, and the staff were amazing! Would highly recommend! Loved the layout of the room; it had a very home-like feel and was very clean! The wifi worked great, and there was a desk where I was able to work from, while my wife worked from a small table in the kitchen area. There was also a small couch and a good size wardrobe for our belongings. All the essentials were provided, as well as nice extras like a small cake treat and coffees. 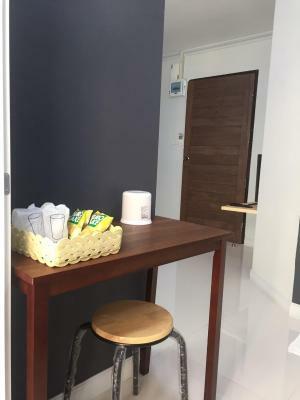 Clean, comfortable, close to restaurant, massage place and 7-Eleven. 120 BHT for taxi to airport that’s 15 minutes away. We were using the hotel as a stop over between flights. It is a little distance from the Airport, but not too far, so use the short distance taxi rank at Bangkok Airport. The rooms are well equipped, very comfortable, good shower and bed and include kitchen facilities. The staff were very helpful, arranging taxis for us to get to the local train station so we could explore the city and for our early morning onward flight. No complaints and great value. NB: The location will not provide you with stunning views, unless you like shipping containers and industrial units but is great for a short stay. The room was clean and comfortable. The refrigerator was on when we entered the room. That's a plus. Good price for what you get, definitely wouldn't stay more than a night or two if needed. But great for value if a quick stay in is needed for the airport. This place was just what I wanted. Not fancy but spotlessly clean, and. 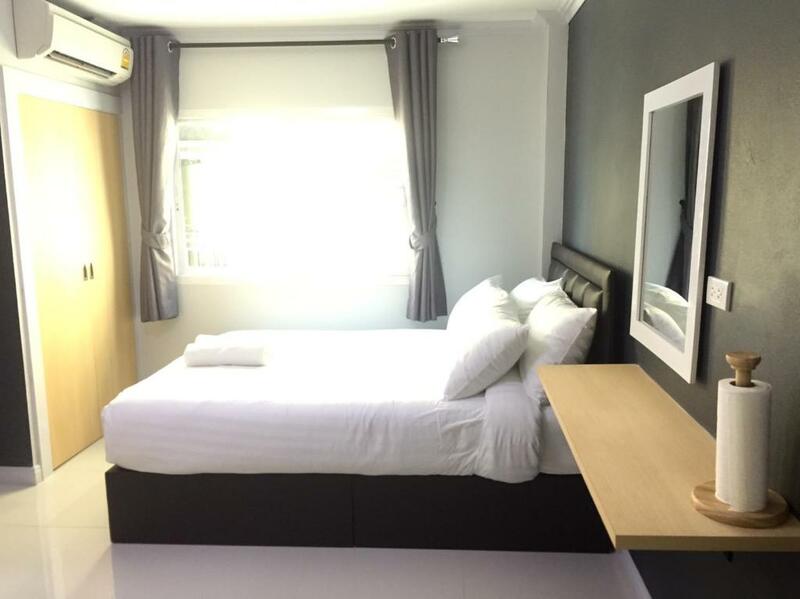 10-15 minute drive from Suvarnabhumi Airport. I got there at 2:00 am and staff person was waiting cheerfully for me. Check out time is 12, so lots of time to rest. Typical Asian hard bed, but I sleep well on those. They prefer cash payment; add 3% for credit card. They call taxi for you, since it’s a bit off the main road. A-Place Suvarnabhumi is located about a 10-minute drive from Suvarnabhumi Airport. Guests can enjoy the on-site restaurant. Free WiFi is available throughout. Rooms come with a flat-screen TV with satellite channels. Certain rooms feature a seating area for your convenience. 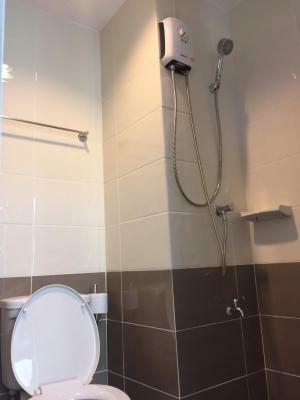 Each room includes a private bathroom fitted with free toiletries and a hairdryer. There is a 24-hour front desk at the property where transfers between the property and Suvarnabhumi Airport can be arranged anytime. When would you like to stay at A-Place Suvarnabhumi? This twin/double room has air conditioning, tea/coffee maker and dining area. House Rules A-Place Suvarnabhumi takes special requests – add in the next step! 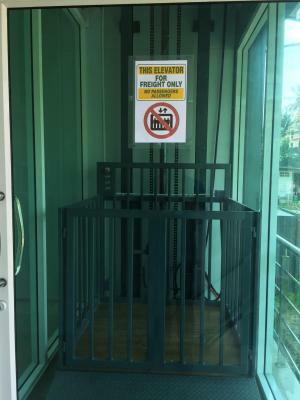 All children under 16 years are charged THB 200 per night for extra beds. Any additional older children or adults are charged THB 200 per night for extra beds. A-Place Suvarnabhumi accepts these cards and reserves the right to temporarily hold an amount prior to arrival. Please inform A-Place Suvarnabhumi of your expected arrival time in advance. You can use the Special Requests box when booking, or contact the property directly using the contact details in your confirmation. Staff member not very helpful. Close to airport, quiet, clean. Price. Serves it's purpose, close to the airport, easy and comfy. I was with my Husband and we pretty much loved everything about the place. We only stayed for a day but thinking we would stay for four days we paid the full amount n by the time we changed our mind to rent a hotel near the city n we needed a refund of the money they did not ask any questions instead they said a good yes n they returned our money without any problems and when we leave the hotel they accompanied us to the taxi... they called a taxi for us too. All in all they are the best to pick. Excellent services and close to airport and Airport Line. 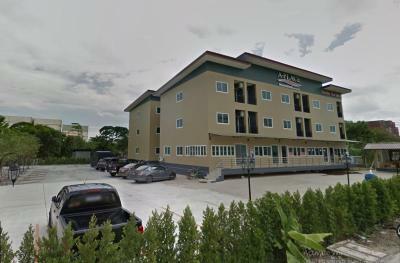 The location is very near to Suvarnabhumi airport!we need a few hours to sleep so it was a good decision to stay there! Air conditioning is located right opporiste the bed and it was not nice to get cold air blown on the face. Other than that everything was good. Location was easy for airport. Bed was comfortable, it was nice to have a teapot and tea available. Wifi was also good. The location was fairly good and a short ride to the International airport with a fixed rate for the taxi which i felt was overcharged. The bed was comfortable and the room was not real noisy. Shower water flow rate was average. Rude young girl who stays talking on her mobile phone without a word, just showing us a paper to sign when we arrived. In the morning, not even a "good morning". Poor location (only a 7/11 10 minutes walk in a dark street).too Small bathroom. This place said that it has car for customers between airport and hotel. But I found out it means taxi that I had to pay 150 Baht from Airport to this place. And I had to pay 120 Baht to get back to the Airport for my flight.